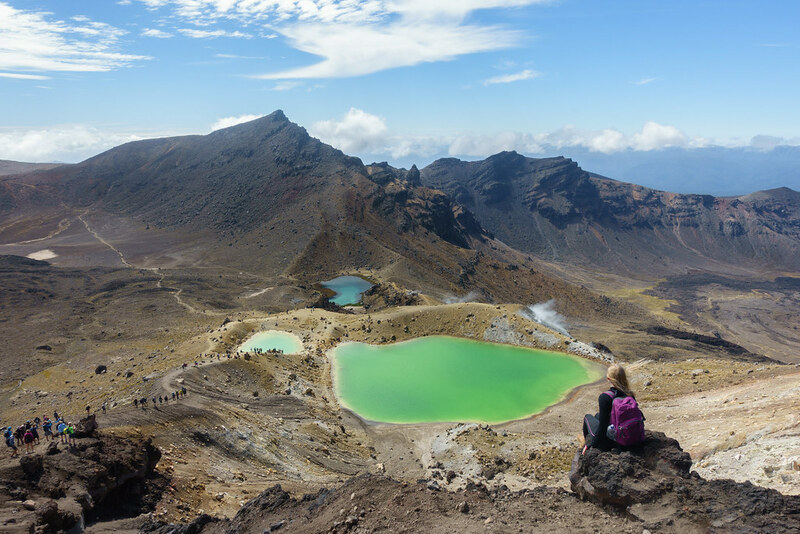 This is the tenth of a series of posts detailing mine and my sister’s trip to New Zealand’s North Island. View all the posts here. 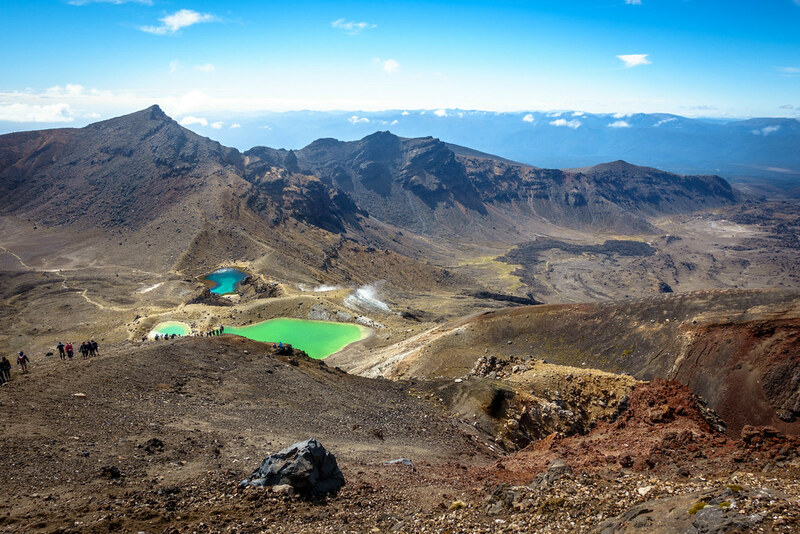 The Tongariro Alpine Crossing is said to be one of the best one-day hikes in the world. 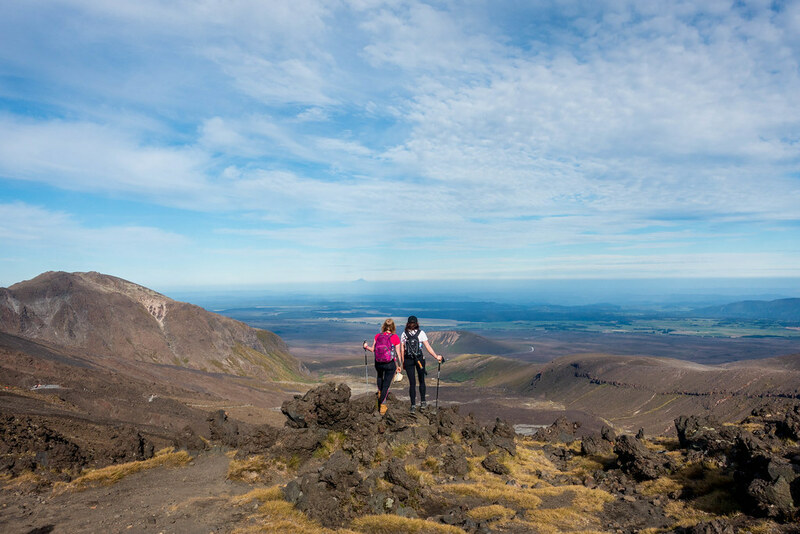 For almost 20km it takes you up and down volcanoes, over vast craters, past emerald-coloured lakes, and high above epic mountain valleys. As I read about it beforehand it sounded amazing – but it also sounded very challenging. My daredevil, much-fitter-than-me sister had of course set her heart on doing the walk. But the warnings issued by the company transporting us there that we had to be “moderately fit” to complete the walk, and that we had to finish by 4pm or else be stranded (miles and miles from civilisation and public transport), made me increasingly nervous as the time drew nearer. I considered backing out completely. 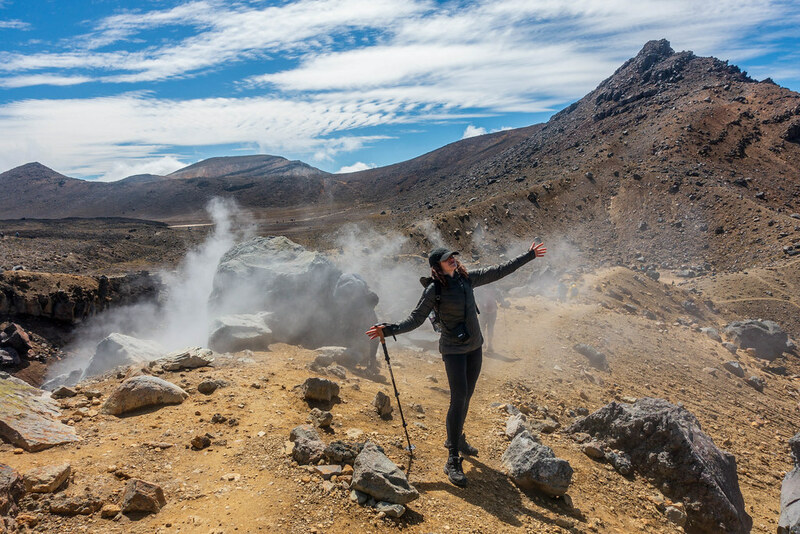 But the day before I resolved to take the risk, and we booked our place on the bus with Tongariro Crossing Shuttles (this should be done at least a day in advance). 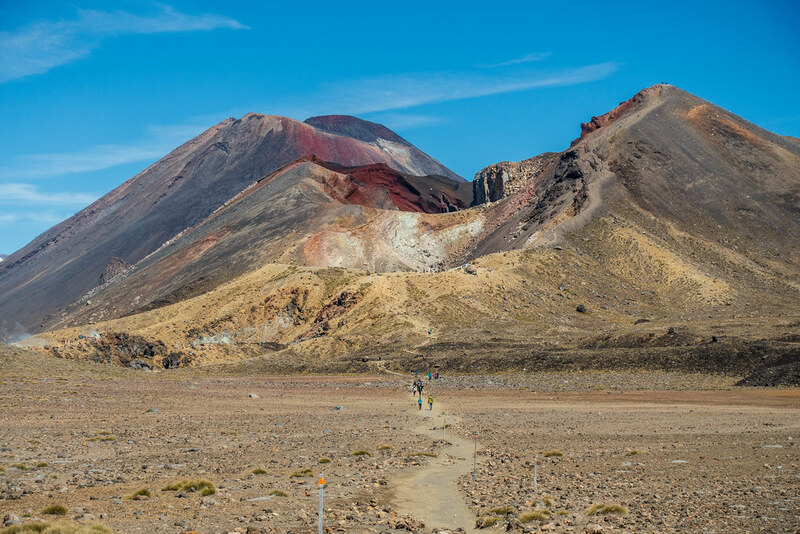 We began preparations for Tongariro the night before. 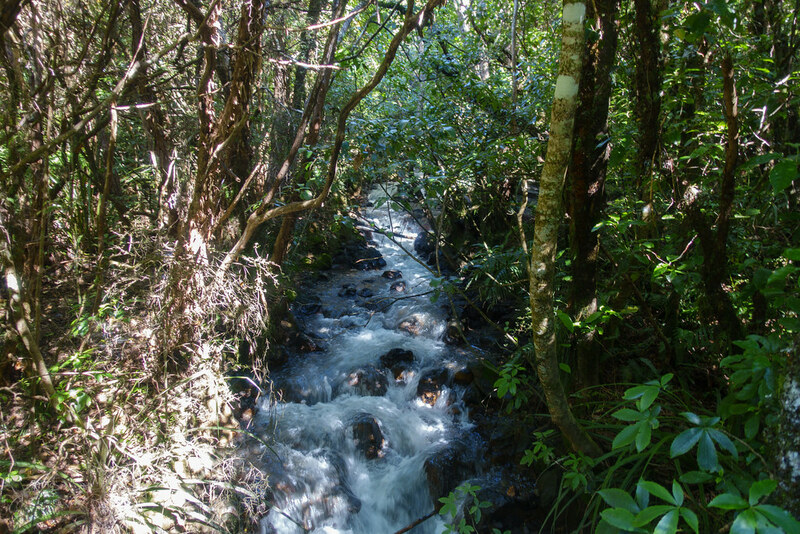 We went to the Taupo Pak ‘n Save and bought ingredients for dinner that night and sandwiches for tomorrow, as well as multiple bottles of water, juice, cereal bars, and dried fruit for snacking on. Back at the hostel, we prepared and ate a large dinner of pasta and vegetables in tomato sauce and packed what was leftover for the walk. We also made sandwiches of grated carrot and feta and spinach hummus. I had the seemingly brilliant idea of freezing our water bottles so that they’d be nice and cold for the walk, and we went to bed at 8.30pm. It was a disaster. We had no more bottles to fill from the tap, no time to buy more water, and no opportunity to get water anywhere on the way to or during the walk. We both knew full well that water was the number-one requirement for completing this day-long hike, and that completing it without water would be seriously dangerous. So what were we to do? We thought to search the communal fridges for bottles we could use and, by some absolute miracle, we found two unlabelled, large bottles in the free food section. We emptied and refilled them with a huge sigh of relief. 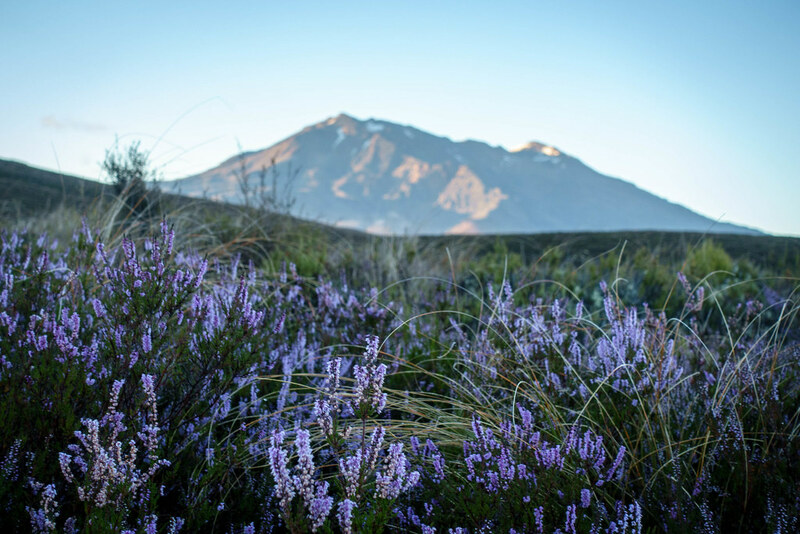 The bus came to pick us up at 5.10am and we eventually reached the Tongariro Alpine Crossing track at 7.10am, just as the sun was rising over the horizon. 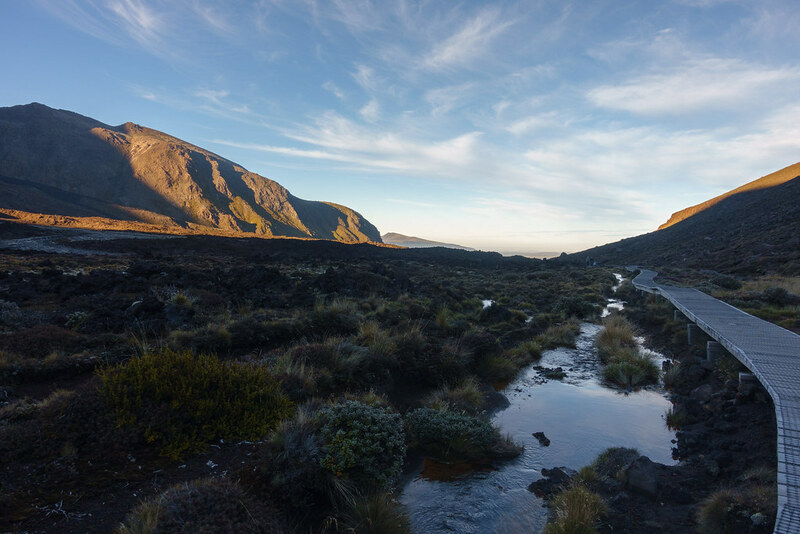 Beginning the walk at dawn is unquestionably the best way to do it. We were some of the first people on the track that day, and the dawn-lit atmosphere felt wonderfully quiet and peaceful, even as groups of people hurried to overtake us on the crowded path. 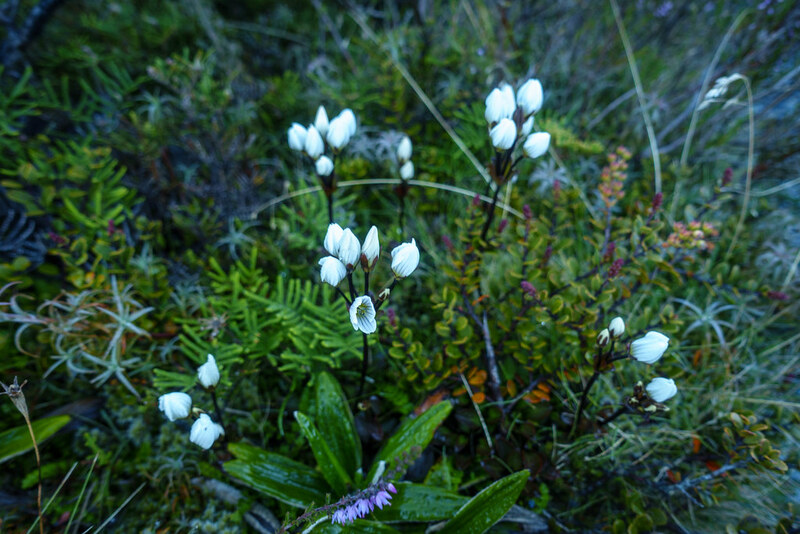 The first, reasonably level stretch goes through a wide alpine landscape covered in heather that wouldn’t have looked out of place in Scotland. There are two opportunities to go to the toilet, which you should definitely take because the next opportunity comes after all the most exciting parts of the track which you’ll want to spend a long time enjoying. 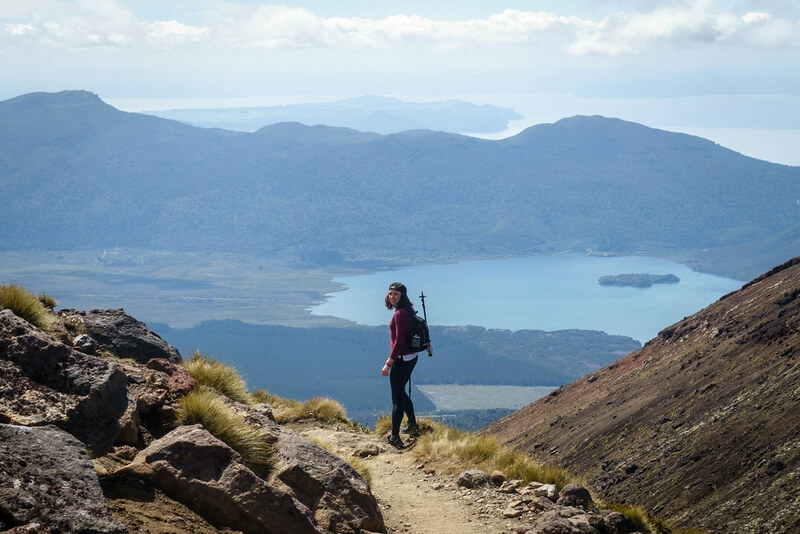 The first lengthy, zig-zag ascent was pace-quickening but perfectly manageable, especially with all the breaks we took to take photos of the view back the way we came, which grew more impressive the higher we went. 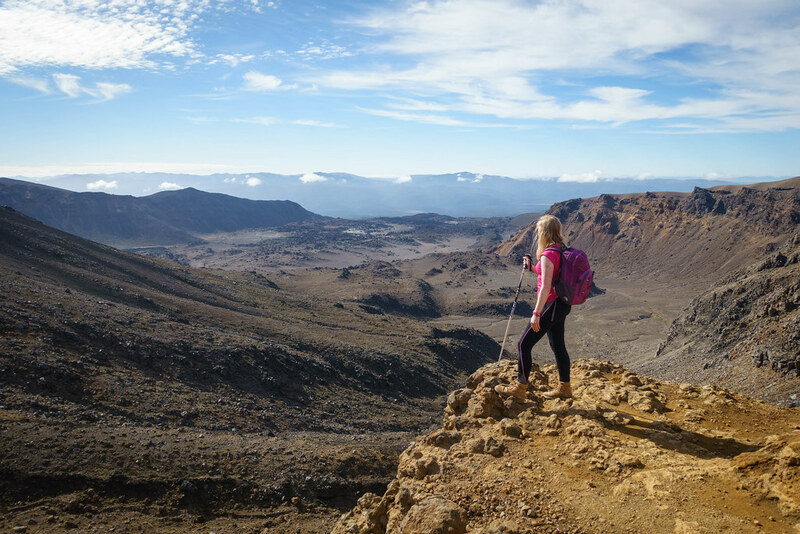 The path levels off as you walk across the wide plateau of the South Crater. 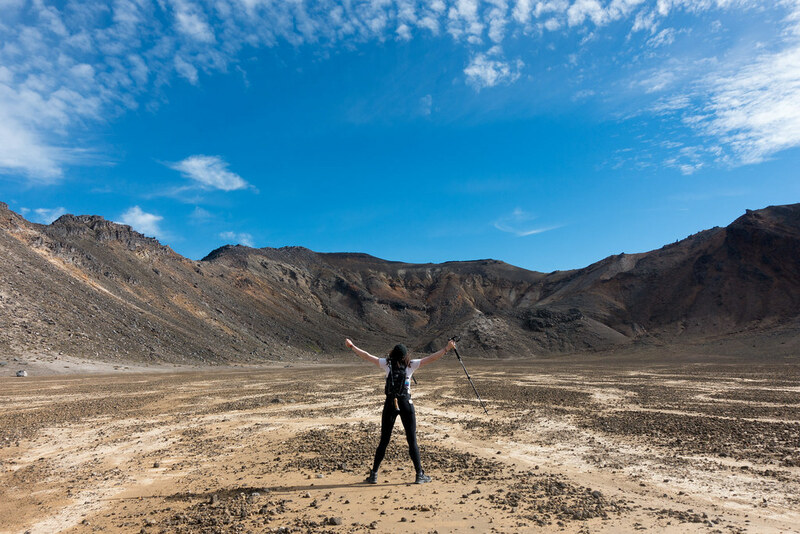 Standing on this dusty flat, surrounded by high ridges and mountains, I felt very small and awed by the power of the volcanic forces that created this landform. 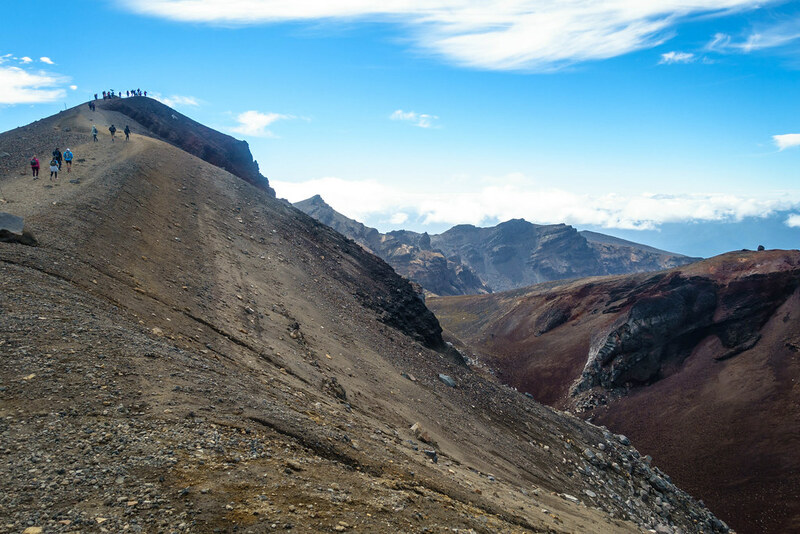 The next ascent, up to the peak of a volcano, was the steepest and most physically demanding of the track. There isn’t a clear path, rather an uneven mountain side scattered with obstacles and earth that shifts beneath your feet. At one section there’s a chain in a wall of rock that you can use to help pull yourself up. Everyone just finds what looks like their easiest route and takes it. However, the challenge is offset completely by how spectacular the view is. 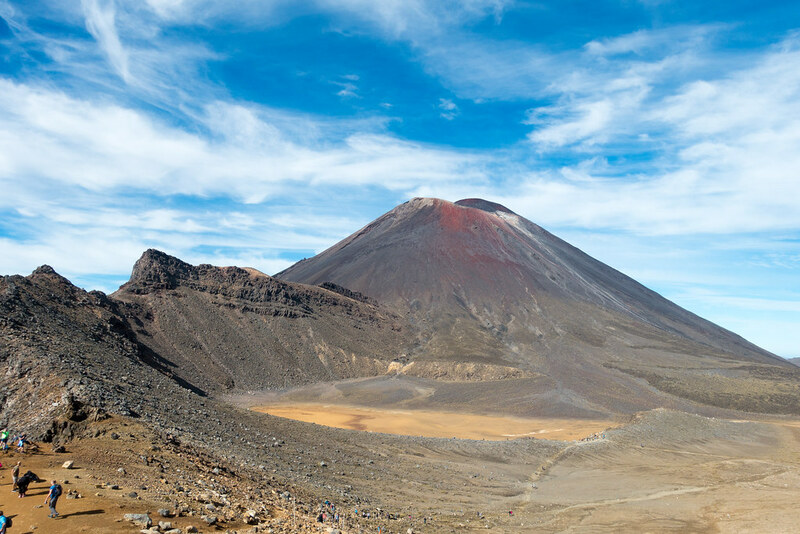 There’s the yellow South Crater on your left, Red Crater on your right, and the epic black, white and red Mount Ngauruhoe – more commonly known as Mount Doom in Lord of the Rings – behind you. As you can see below, the panorama is out of this world. 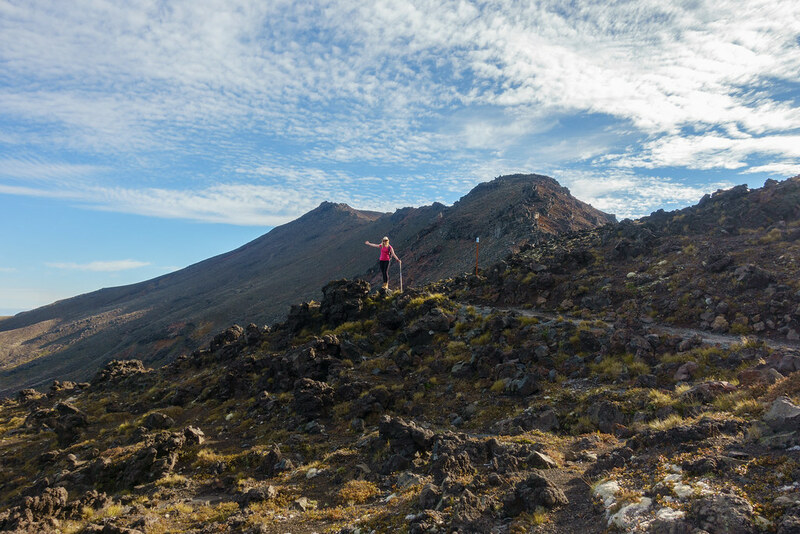 At the summit there’s space to wander and admire the view before proceeding down the other side of the volcano via a long, steep slope of black scree. 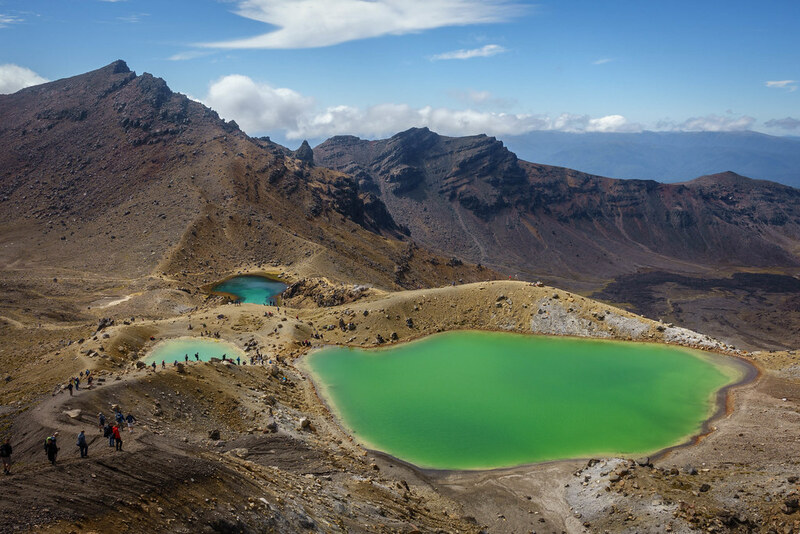 At the bottom lie the amazing Emerald Lakes, shining like three green beacons in the distance. 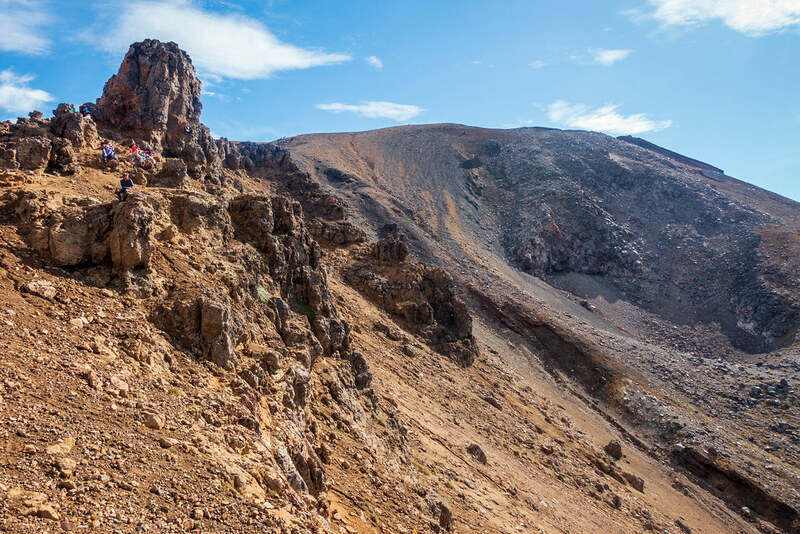 The scree slides with every step, making it difficult to stay upright as you descend – hiking poles are vital here! The steady stream of people working their way downhill were sliding and falling all over the place. 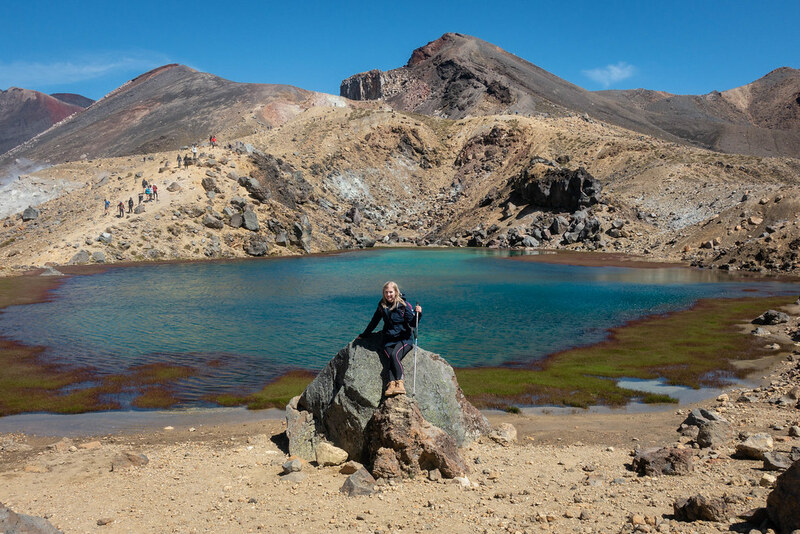 It’s wonderful seeing the Emerald Lakes grow bigger and more beautiful as you draw closer, and we couldn’t resist taking photo after photo wherever we found firmer footing. Having reached the bottom we ate lunch beside one of the lakes. It turned out we had brought far more food than we needed. Afterwards we took the slightly longer way around the lakes so that we could see more of them and the surrounding, steaming mountains. We could barely believe our eyes at how incredible and otherworldly everything looked. 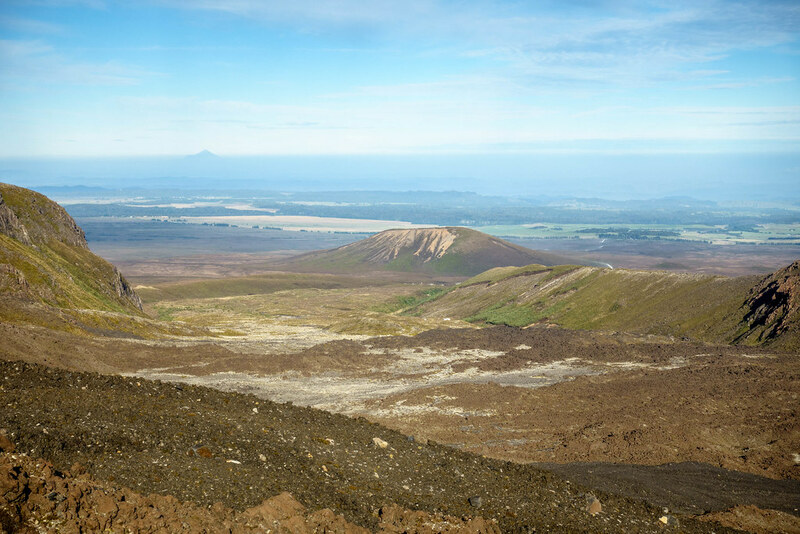 From here there was an easy climb up to the central crater and Blue Lake, where we took our final photos of the barren volcanic landscape. Onwards from here were the first toilets since before Red Crater, and a level path that took us into a much greener landscape. The path curved around a mountainside, high above a verdant valley of forests, fields and lakes. Unfortunately, we realised at this point that we were running late. We had no choice but to rush down the gentle, zig-zagging descent through countryside. 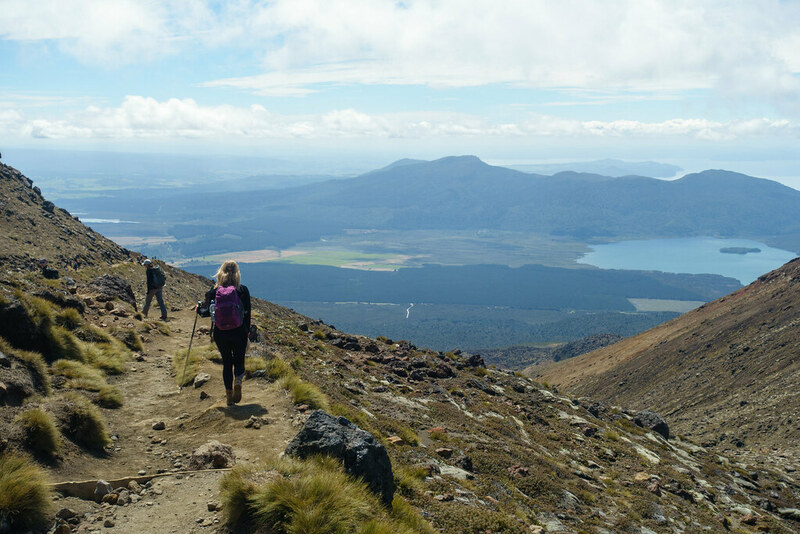 We made a brief stop at the Ketahi hut to top up our sun cream, then continued to jog and power walk the rest of the way. Open countryside gradually became dense rainforest, and this much less interesting section seemed to stretch on for ages! But eventually, and with great relief, we reached the car park with half an hour to spare. We were the last people to get on the last bus back to Taupo. Arriving back at the hostel tired but extremely fulfilled, we freshened up and went out for dinner at Taupo Steak House. Neither of us had steak: Tama had fresh fish in filo pastry and I had Caesar salad. Afterwards we walked over to see the lake, but our beds were calling us. We returned to the hostel and just about managed to pack our bags before falling into a deep, much-needed sleep. 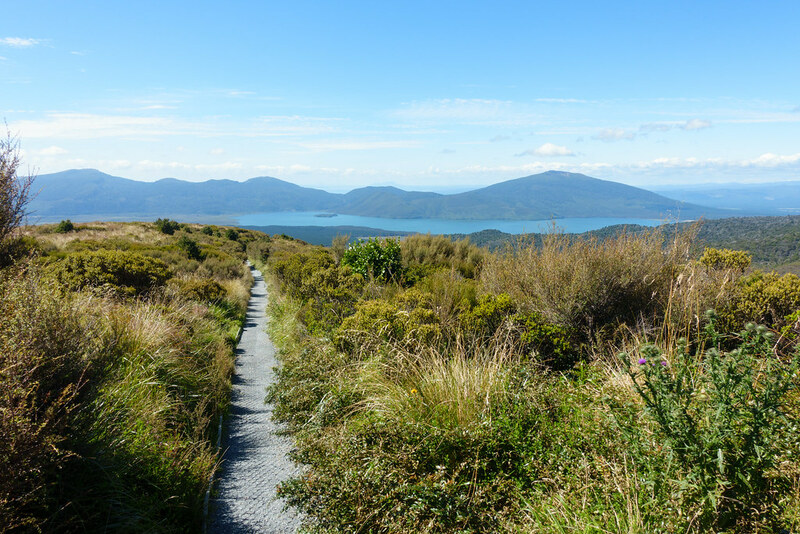 The next morning, after two weeks of travelling round New Zealand’s North Island, we went our separate ways: Tama onto Wellington, and I to Auckland to catch my flight home. It had been an amazing adventure with my sister, and one that I’ll never forget. Subscribe to this blog or Like and Follow Roam with Juliet on Facebook to be alerted when my next post goes live. All text and some photos (c) Juliet Langton, some photos (c) Tamasin Langton, 2018. All rights reserved. 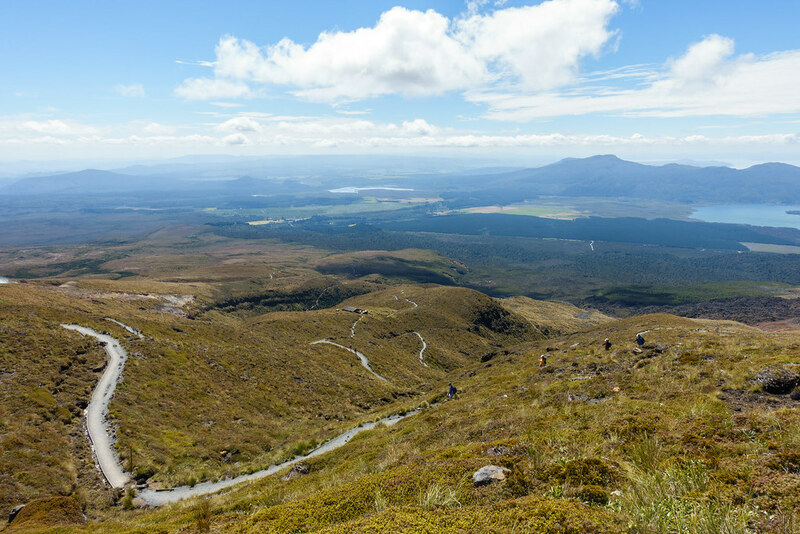 Posted in New Zealand, Photography, TravelTagged Tongariro Alpine CrossingBookmark the permalink. It was nerve wracking for sure! But one of the best experiences ever.